August 2015 in Redland, Florida – One of the largest available land sites in Miami-Dade County has been sold. The 95 acres of land is located in the Redland on Southwest 328th Street just west of 217th Avenue. The sale price was $2,775,000 or about $29,000 per acre. ComReal Miami’s Edward Redlich and Chris Spear in co-operation with Mike Shelton and Ben Crosby of Crosby & Associates represented the seller. All four broker happen to possess the Certified Commercial Investment Member (CCIM) designation which helped with the disposition of the property. The team had gotten to know each other while involved in leadership positions with the CCIM Florida Chapter as well as Florida Realtors. They used the latest UAV drone technology to take aerial videos and photos of the property which really helped tell the story of what was being offered to prospective buyers. Redlich states that “It is almost impossible to acquire this much contiguous land. 95 acres is a huge parcel for Miami-Dade County given that we are bordered mostly by Biscayne and Florida Bays as well as the Florida Everglades.”. Both Redlich and Spear had also grown up in the Redland so they enjoyed going back to their roots. (Pun intended). The seller was Primo Groves and the buyers are The Raolji Family. The buyer was represented by Keyes. The new owner intends to keep farming the property for guava, dragonfruit, squash, beans and other various row crops for vegetables. 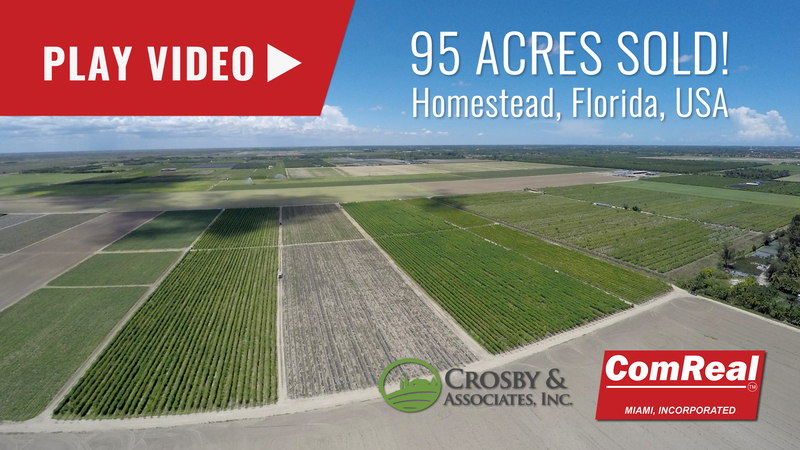 For more information on land for sale in Florida, please visit www.ComReal.com and/or www.CrosbyDirt.com. Thank you very much.